Why you have to choose AirDisk USB 3.0 Wireless Flash Drive? AirDisk Wireless Storage Flash Drive - We solved pains on Memory and Network! ✦ Smartphone is running out of the memory, and must decide which photos to sacrifice & delete to get space for the new content? ✦ Just sitting there in a daze without any Wi-Fi hotspot? ✦ Nervous to have your privacy disclosure? ✦ Anxious to wait for hours to copy a large file? ✦ Trying to share files and get to know there isn't any network around? ✦ NoBody-else can access file inside your AirDisk via wifi without password. ✦ Automatically backs up your camera roll as connected. ✦ Stream HD videos and music to up to 3 devices at the same time. ✦ Wirelessly access to your storage content without any Internet required works great with all of your devices-from iOS to Android smartphones and tablets, PC to Mac computers. WIRELESS USB 3.0 FLASH DRIVE TO EXTEND MEMORY: Reinvent for your phone, tablet and computer with super-simple AirDisk App wireless connection to get one-touch-backup for phone contact, albums, videos, photos, files etc. Never feel the frustration of trying to decide which photos to sacrifice & delete so you can take more. Note: AirDisk Wi-Fi will be shut off automatically when connected to PC. PREFECT TRAVEL COMPANION: Ultra-compact design with build-in battery. Once synced to your iPad, iPhone or tablet it can Stream HD videos and music to 3 devices at the same time. So you could enjoy hours of entertainment flawlessly, which is great for long ride and flight. With USB 3.0 interface @ 150MB/s , it takes around 30s to copy an HD 4G movie from PC to AirDisk. AirDisk can also automatically back up photos and videos from your phone, which makes your busy life more smoother! ENCRYPTED SPACE: FUNCTION TO PROTECT PRIVACY: You could set password for vault(Encrypted Space), keep your private data safe even if the AirDisk gets lost. Also support wifi password setting and No one could access your AirDisk file via wifi without your password. You could get your lost password by pressing and holding power button for 30 seconds and get factory setting without any data delete. Definitely the most compact portable storage solution! UNIVERSAL COMPATIBILITY: This wifi storage stick is compatible with iPhone 8/8 Plus, iPhone X, iPhone 7/7 Plus, iPhone 6/6S Plus, iPad Mini 2/3/4, Mac, Samsung Galaxy Note 8, S8, S8+/S8 Plus, Note 5, Galaxy S6 Edge Plus, Galaxy S7, and Galaxy S7 Edge and more android cellphone, PC or Mac computer, Windows® 8, Windows 7, Windows 10, Windows Vista®, or Mac OS 10.6 or higher, support video format: avi, mp4, mov, mkv, 3gp, rmvb, flc, wmv, vob, mpg etc. 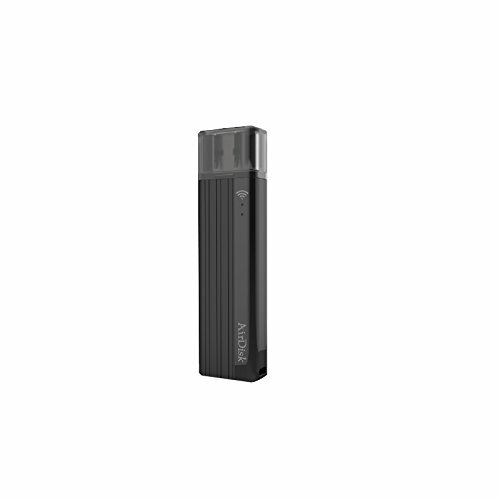 GET THIS WIRELESS FLASH DRIVE RISK FREE: AirDisk products are constructed to the highest standards and rigorously tested. You can be confident in the outstanding quality, performance and reliability of every AirDisk product. Since your satisfaction is our top priority, this wireless storage drive is backed by our 60-day money back guarantee policy! If you have any questions about this product by airdisk®, contact us by completing and submitting the form below. If you are looking for a specif part number, please include it with your message.